I can't find nozzle temperature in the per model settings. I wanted to print out some 20mm cubes, each one at a different Temperature, to see which temperature was best. Even when I checked ALL I didn't find Temperature anywhere. The only way I can do it now, is to do a print each separately and go in and manually edit the file, modifying the Temperature for each cube, in the Gcode. I can do that, but it would be nicer to be able to do it in Cura. If you are using dual extruders, each nozzle will be listed by extruder number. 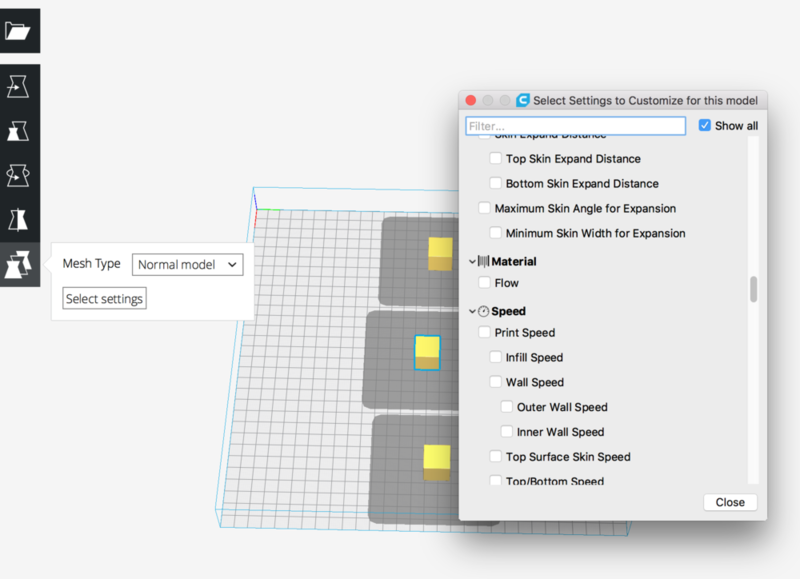 In CURA the temperature is located in the MATERIAL menu. You can also make a search for 'temperature' by using the 'Search...' bar right above all the settings and just under the 'Profiles' drop down menu. Hmm. Maybe I didn't make myself too clear. Let me try again. This is PER MODEL SETTINGS. I have 3 cubes. I want to print the 1st one at Temperature 195, the 2nd at 200, and the 3rd at 205. If I select any model and try to set the Temperature, it is NOT one of the options. Ok, my mistake, I misunderstood what you meant. If it's not on the options, then it is not possible at the moment. And I don't think it would be really doable to print different models at different temperatures at the same time. The printcores would have to heat up and cool down all the time, which might be damaging in the long run, and it would also increase your print time quite a bit, as you'd have to wait for the heating and cooling of the cores. You'll have to print your cubes one by one, changing the temperature manually. ok. too much to ask. as a retired programmer of more than 35 years, I know that if that per model option existed and it was non-null for ANY particular model, then I would set a flag to over-ride the print all at once option (no matter what it said), and put a pop up message to that effect, to "print one at a time". but I only prepared one at a time, and changed the gcode to the temp that I wanted. It will work. But it would have been slicker to print all of them "one at a time" at different temperatures. Thinking about it, maybe I should change the gcode to NOT cool down in between, so I can print them faster. There is a print one at a time option if you are not using more than one extruder.